I enjoy making friends wherever I am. At a roadside tourist shop in the desert I met this interesting Native American who agreed to pose for this brief portrait study during a lull in business. 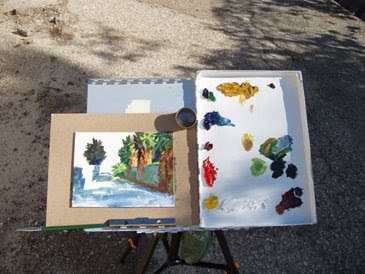 I wanted to paint in direct sunlight, and set up my easel on the edge of the parking area. As I painted this, it caused a number of passing motorists to pull off the road and stop to watch. Soon I had lost my model who had to attend to the customers, but I was able to complete this much of the portrait before that. 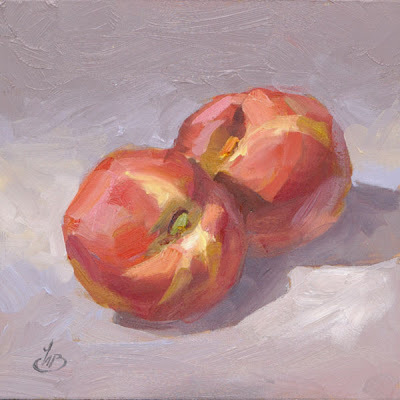 I rarely show portraits on my blog, and I felt this would be an interesting change of pace from my plein air landscapes. Thanks for looking, and have a great day. 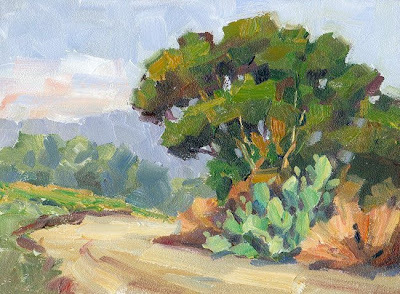 Laguna Coast Wilderness Preserve was the site of a recent plein air workshop I conducted for a group of dedicated artists. Beautiful vistas surrounded us as we painted there on a bright, sunny day. 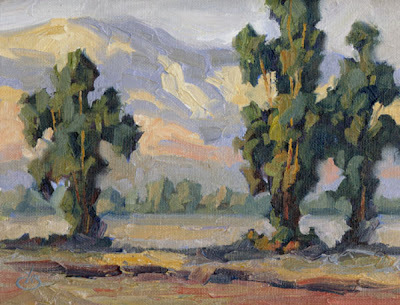 Rather than paint a sweeping vista I decided to capture a more intimate glimpse of nature in this painting. It makes a wonderful keepsake of a beautiful day. I hope you like it; thanks for stopping to look. PS - I want to thank everyone for the enthusiastic feedback about my recent tips for increasing their art sales. It’s heartwarming to hear how helpful you are finding this information. Have a great day and thanks for looking. 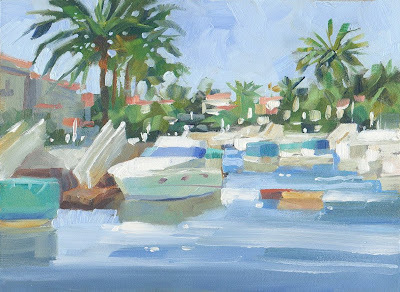 Sparkling white boats caught my eye in this charming scene and I felt compelled to capture the moment in this painting. I was able to set up my compact easel from a quiet vantage point on a bridge over the canal. This was one of those rare times when the painting seemed to paint itself. At times like this I simply hold on to the brush and go along for the ride. And it was a wonderful ride. 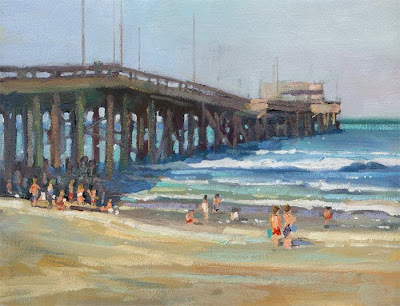 Newport Beach, California is a popular vacation destination for tourists and an inspiring spot for plein air painters. I recently conducted a plein air workshop for a group of other artists at this spot. Inspiring scenery surrounded us, with the pier nearby, the ocean and beach, palm trees and ocean vistas, and of course this charming outdoor café area with the colorful yellow umbrellas. This painting was done at another time in the studio, when I was able to devote more time and attention to detail without interruptions by tourists passing through. I hope you like it. ARTISTS - Sales can be better than ever EVEN IN A DOWN ECONOMY if you do things right. But most artists don’t have a clue. Artists who could be earning good money keep asking me for help. So I’ve put the answers into a practical and usable guide for creating RED-HOT SALES that every artist can use. It costs just $20 – how many sales will it take to pay for that? Here are a few things it covers. 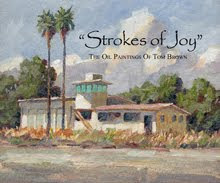 To get my guide for creating RED-HOT SALES, email me at tombrownstudio@cox.net. Hear that? It’s opportunity knocking. 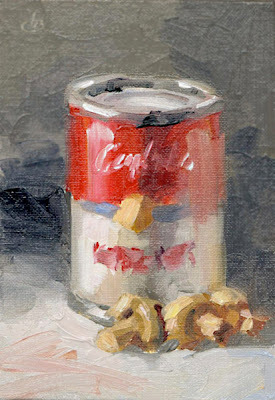 ARTISTS: Want to know how to create RED-HOT SALES in a down economy? Let me know if you’re interested. It’s not only possible; it’s easier than you think. I’ll offer some tips about it on this blog soon if there is enough interest. Here’s why. Artists keep asking me how to improve sales in a down economy. The truth is that sales can be better than ever, even in this economy. If your marketing efforts are on target. But most artists don’t have a clue. Where should I show my art? How can I make more people see my work? How can I connect with buyers? How can I stand out from the rest? How can I get a wider audience without spending money? Should I be on eBay or other auction sites? What about the social networking sites? Rather than answer these questions one at a time, I have decided to share this with everyone if there is enough interest. It’s a lot of material, but it’s organized so it can be used in little increments or a full-on assault. If you want to thrive in this economy, you’ll want to have this. Many artists successfully make a living from their art. And we have fun doing it. BTW: There are FAR MORE successful artists out there than you realize. Many of them are flying below the radar, which is why YOU don’t know about them. But their buying audience knows about them – and continues to buy, and buy, and buy. Here’s the irony: Many of these successful artists are nowhere near as good as loads of unsuccessful artists. They simply know how to create red-hot sales – and keep it going. No matter what the economy. That’s what makes all the difference. Thanks for looking. Have a tasty day! 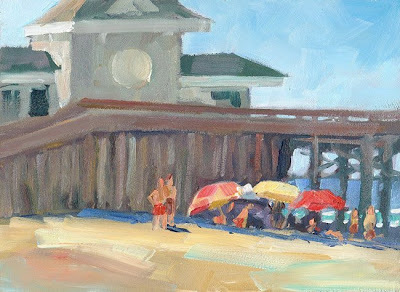 This is a small study painted at Newport Beach this past weekend during a Plein Air workshop I conducted for other artists. These colorful beach umbrellas caught my eye. They were set up beside the base of the pier and lifeguard station. 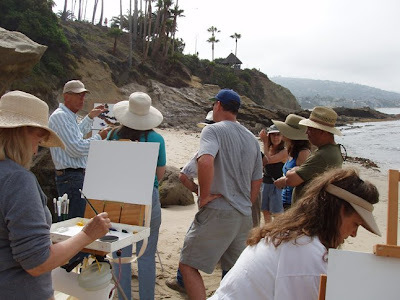 It was a clear, sunny day – perfect beach weather and perfect Plein Air painting weather! Wish you were there! Thanks for looking. Have a beautiful day! Email me at tombrownstudio@cox.net to purchase this painting. In response to many requests for more step-by-step demonstrations of plein air painting, I invite you once again to look over my shoulder as I work. 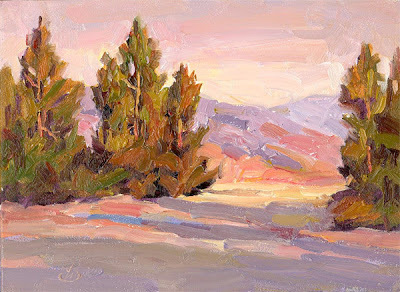 This piece was painted high in the mountains near Big Bear in the late afternoon. The golden-orange sunlight turned the pines a ruddy brownish green that I wanted to capture. I knew these lighting effects were very temporary. So rather than take time to set up the full-sized easel I normally use in my TV shows and Plein Air workshops, I used the $20 pochade box from my CD “PLEIN AIR PAINTING MADE EASY.” It is entirely self-contained and holds a fresh panel, a wet palette of paints and my dipper cup. There is no setup time; I merely open the paintbox and I’m ready to go. Using a diluted wash of ochre I sketched the composition, then quickly blocked in the darkest darks using a mix of cadmium red and ultramarine blue. I also indicated foreground shadows with a transparent wash of the same colors, emphasizing blue in the mixture. The next step was the most critical. I “captured the fugitives” (elements that are likely to escape while I’m painting). In this case it was the colors of the pines, sky and distant mountain (step 3). By carefully placing these important color notes at the point where they intersected in the painting I was able to evaluate whether they worked well together. 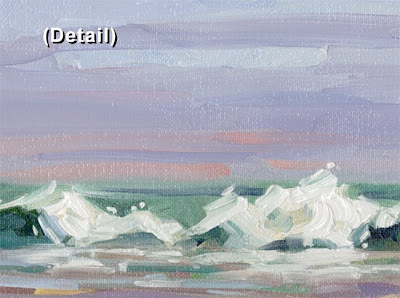 This was a key to colors throughout the painting. Then I could proceed with confidence. As I worked I echoed key colors throughout the panel for color continuity and paid special attention to little touches of magic that charm the eye; details like carefully placed tree trunks and limbs, interesting edge treatment, etc. These factors keep a painting interesting over the years, and keep collectors coming back for more of these little treasures. One of the key factors in a successful long term career as a fine artist is to keep collectors happy (no, make that THRILLED) with your work. Paint first of all for yourself. Paint from the heart, whatever excites or moves your spirit. But only let collectors have your best work. This will reflect well on you and help create a large and loyal following. I sell small paintings like this to enable new collectors to sample my work at affordable prices. Many times it leads to commissions. And when I accept a commission, I always deliver my VERY highest quality of work. And I always deliver in a timely manner. If you want to keep collectors happy, you must paint from your soul. Paint what you love. Only then will your work thrill, excite and delight collectors. And in the end, you will both be happy. Email me at tombrownstudio@cox.net for purchasing details. 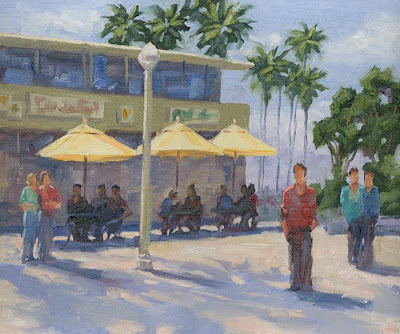 I just returned from teaching a Plein Air Workshop at Newport Beach this morning and I felt it would be interesting to post this painting that I created on-site as a demonstration for the class today. This painting is a bit larger than I normally create on location, but my studio paintings are often a great deal larger than this, often as large as 5 feet wide. Creating a large painting is an exhilarating experience that provides a true sense of accomplishment. 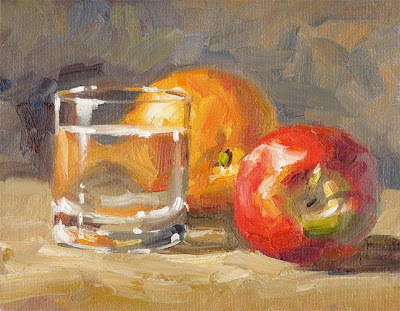 But many artists struggle to retain freshness and vitality in their paintings when working on a large scale. My new “Painting BIG package” is now in stock again, and it will help any artist overcome the common pitfalls encountered when creating larger works. This package includes a two-part video from my TV show entitled “Secrets To Creating Successful Large Oil Paintings,” where the camera follows me from start to finish as I create a large painting. PLUS you will receive a printed guide entitled “Essential Secrets To Painting BIG.” This is an absolute must for any artist who wants to create successful large-scale works or paintings that require multiple painting sessions to complete. Beauty can be found in unlikely places. I couldn’t resist creating a small painting of this scene but I also work much larger. Many of my studio paintings are several feet or more in width. 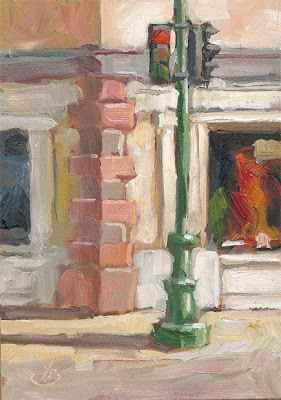 Small paintings are an ideal way to capture the moment when working on location, but my studio paintings are often as large as 5 feet wide. 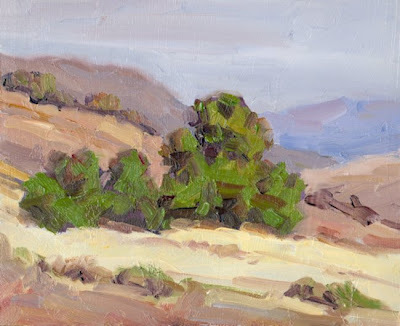 Many artists who follow this blog have been inquiring about my Plein Air Painting videos. All my earlier videos are currently sold out, but I am excited to announce that I have just received a new shipment of my TWO NEWEST VIDEOS from my TV show on Plein Air Painting. 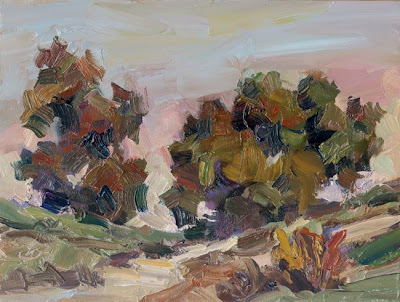 Each video was filmed entirely on location, and the camera zooms in very tight to capture subtleties of color mixtures on the palette and brush techniques as I apply strokes of rich, juicy oils to the canvas. “JEFFREY OPEN SPACE TRAIL” follows me from start to finish as I work on a large toned panel. 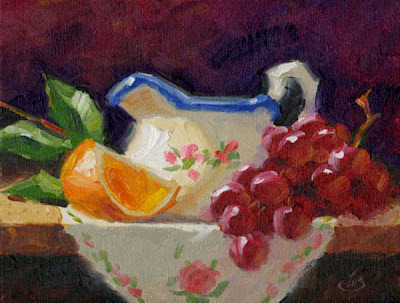 You’ll see how to create color variety and continuity throughout the canvas. 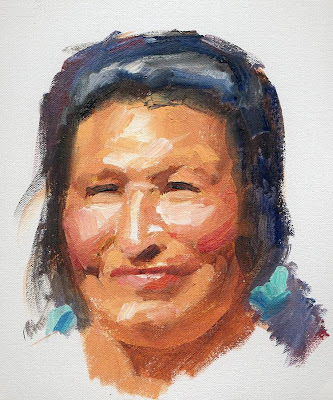 You will learn about underpainting and overpainting, as well as how to mix the proper consistency of paint for various effects, and much more. In this video I also demonstrate a variety of practical and inexpensive equipment options you can make for outdoor painting. 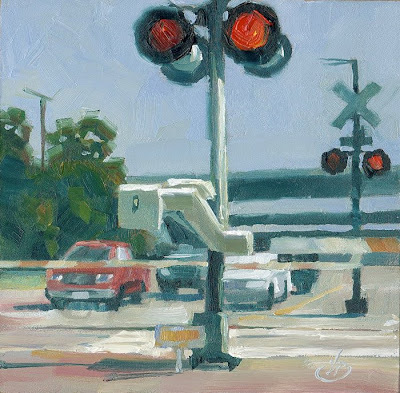 “PAINTING PLEIN AIR MINIATURES” follows the development of TWO separate paintings in a single video. In this lesson I discuss when, why and how to paint miniatures on location. 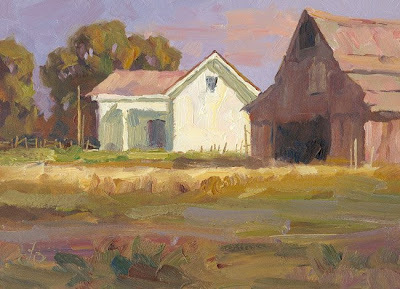 This video includes lessons on how to unify value-masses in your paintings to create solid compositions, how to lead the eye to the focal point and how to create sizzling surface texture. Email me at tombrownstudio@cox.net if you’re interested in this painting. I love to explore back roads in the countryside. It always seems that something fascinating could be around the next turn. Sometimes it’s a surprising vista, or a charming small town that time has forgotten, or merely the simple beauty of sunlight and shadows streaming across the pavement. The road always seems to beckon me to take just one more turn. It’s a wonderful escape from the hustle and bustle of our daily life and high technology, to simply get away from it all and take a long ride on a country road. Thanks for looking; have a good day. The part of this composition that most intrigued me was the refracted image that is seen through the glass of water. The orange is distorted in strange ways similar to objects seen through a fishbowl. It was a challenge to capture these effects in a convincing manner while maintaining a loose, painterly quality. To purchase this, email me at tombrownstudio@cox.net. This painting was done on location near a spot where we filmed one of my TV shows. It is a majestic setting. Very peaceful and far from the hustle and bustle of the city noises. When I am on locations like this it is easy to forget the cares of the world for just a brief moment and relax with nature as my only companion. Have a peaceful day, and thanks for stopping to look. The subtle colors of twilight can be very difficult to capture, especially because they change so quickly. It’s an exhilarating feeling when everything seems to fall into place and the painting comes together almost as if it had a mind of its own. This was one of those times. I am particularly pleased with this piece; hope you like it too. Thanks for looking. If you would like to own this painting, email me for details: tombrownstudio@cox.net. ARTISTS - Here's your chance to kick off each weekend painting outdoors with a group of enthusiastic fellow artists. 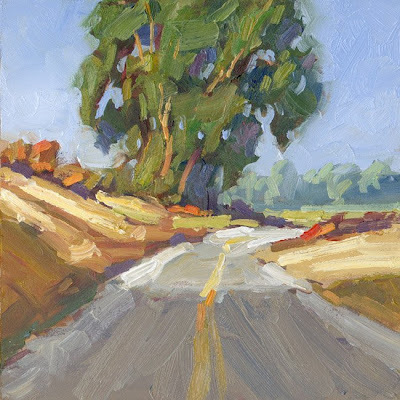 Next Saturday, July 11th is the start of my new Plein Air Workshop. It's for artists of ALL skill levels (from absolute beginners to seasoned pros). Each Saturday morning for 5 weeks we will meet at a different location in Orange County and paint stunning California landscapes together. 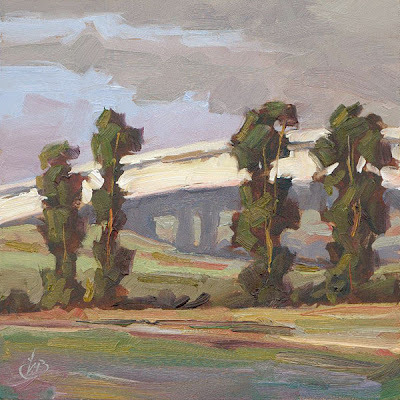 With the right instruction Plein Air painting is easier than you think. And it's inexpensive entertainment too (a bonus in these times). If you haven't seen improvement in your art recently this is the perfect time to jump-start your work by taking a fresh approach. Let me show you how! 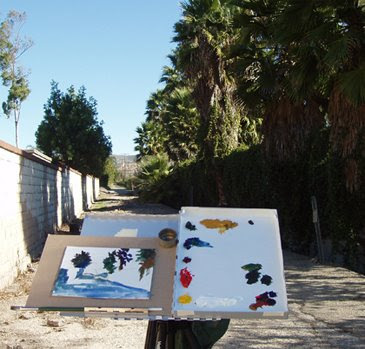 I always enjoy getting out in the open air with my paints and easel. This is one of my favorite spots to paint, and each time I am here it looks different, depending on weather and lighting conditions. I feel this canvas has a very quiet, calm feeling to it. I hope you enjoy the view. If you are interested in a purchase, please email me at tombrownstudio@cox.net for details. Thanks for stopping to look. This abandoned walking path is very quiet and secluded. In fact the entrance is barricaded but I couldn’t help exploring it and I discovered some beautiful sights as my reward. Wild palm trees caught my eye. Some of them are actually growing right through a fence. In the distance another baby palm is sprouting and will soon follow the trend. 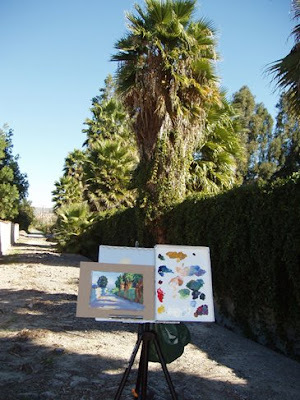 I had brought along my ultra compact painting kit, and I was soon set up in the shade of the palms to capture this peaceful scene on canvas. The only sounds were the rustling palm fronds and birds in the trees. It was a wonderful way to start the day. Here are a few photos that were taken as the painting developed so you can compare my interpretation with what the camera saw. 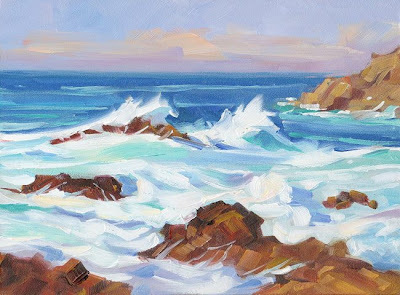 If you would like this little piece of paradise for your wall, email me at tombrownstudio@cox.net and we’ll make it yours. Thanks for looking. By the way, if you are an artist who would like to try your hand at plein air painting you might be interested in one of the latest “electronic handouts” specially created for students in my current workshop. 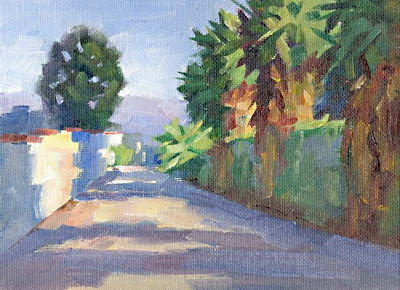 The e-handout is called “USEFUL TIPS FOR PLEIN AIR PAINTING.” It is now available for just $10, and it can be emailed immediately so you can get started right away. 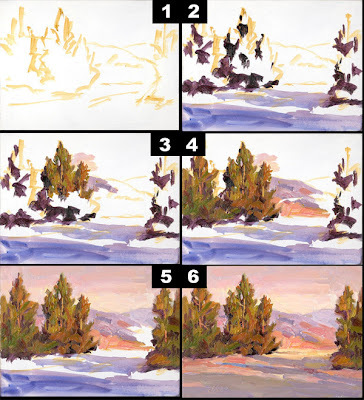 This e-handout gives an overview of my plein air working methods complete with two step-by-step demonstrations. I also provide a complete packing list, tips on how to dress for painting outdoors, and details on an innovative tool for solving perspective problems on location. Email me at tombrownstudio@cox.net for details. These field workers labor in the heat of the sun the entire day, and it must be back-breaking work. 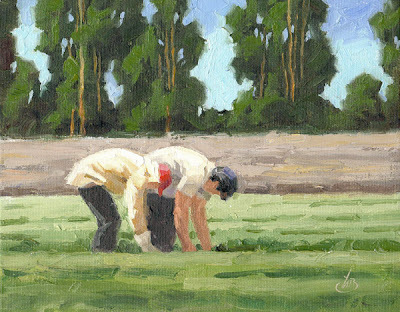 I painted this from the edge of the field where they are picking, directly from life. These fields have been working farms until now, but soon they are scheduled to become housing developments and I wanted to capture this on canvas before it was gone forever. Thanks for looking. Have a peaceful day. 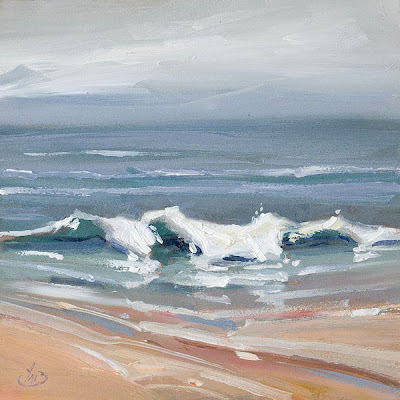 I treated myself to a delicious stroll in the surf when this painting was completed. Nothing is as soothing as foaming surf engulfing your ankles, followed by the unusual feeling of sand being subtracted from beneath your bare feet as the wave washes back out. This is nature’s calming therapy. It’s easy to spot the tourists. They’re the ones who roll up their jeans before walking in the surf, thinking it will keep them dry. But there’s always a sneaky wave that douses everyone by surprise. Afterwards I let the warm sun dry my feet, brushed off the sand and went home refreshed and happy. There’s nothing like a day at the ocean. Find the beauty in the world around you today, and pass the feeling along.